The new V2 has a soft switch! What's up, Buds? Welcome to your new Acapulco Gold! 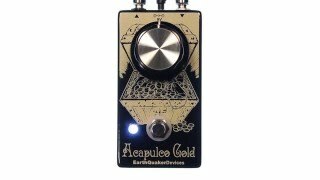 The Acapulco Gold is a dirt-simple power amp distortion device that's based on the vibe of a cranked Sunn Model T. You know what's awesome? Vintage Sunn Amplifiers. You know what else is awesome? Simplicity. One button, one knob. How loud would you like it? Just move the knob. This is the spirit of rock and roll. Quit turning knobs and play that guitar like you mean it. While playing, you may want to try ignoring our suggestion and try fiddlin' with your guitar's volume and tone knobs as these can drastically affect the sound of the Acapulco Gold. The volume knob on your guitar cleans up the pedal nicely, but not too clean. At minimum guitar volume settings, the Gold imparts a hazy, Nashville-sounding spank to your tone. At just-barely-backed-off, the Gold turns into a raunchy overdrive. And of course when the guitar volume is completely open, the Gold roars like a Model T on the verge of explosion. It's not quite fuzz, but so close. Each Acapulco Gold is made part by part, wire by wire, giant knob by giant knob with real, live humanimal hands in our gilded manufactory located in gray olde Akron, Ohio, USA. Big Knob: The big knob sets the output level, sometimes known as Volume. PLEASE BE CAREFUL! The Acapulco Gold is extremely loud! Our pedals take a standard 9 volt DC power supply with a 2.1mm negative center barrel. We always recommend pedal-specific, transformer-isolated wall-wart power supplies or multiple isolated-output supplies. Pedals will make extra noise if there is ripple or unclean power. Switching-type power supplies, daisy chains and non-pedal specific power supplies do not filter dirty power as well and let through unwanted noise. Do not run at higher voltages! Current draw is 30 mA.